(gazeta.kz) - Representatives of Kazakhstani and Russian intelligentsia have brought forth an initiative to carry out a World Spiritual Culture Forum in Astana, Kazakhstan Today correspondent reports. 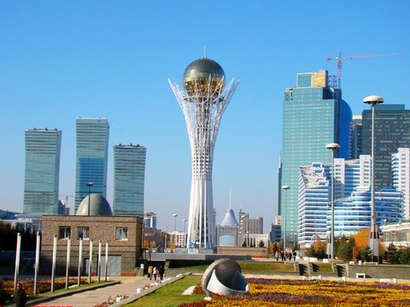 "We suggest holding World Spiritual Forum in Astana, because this city is lately becoming a spiritual capital of the world," - a statement circulated today, October 17, by participants of an international conference "Spirituality and Culture against Extremism and Terrorism" for outstanding figures of arts, culture, science, religions, and the world spiritual community says. According to authors of the document, the world forum could "assume functions of a new spiritual centre, capable of balancing the world situation. The forum must affirm the primate of spirituality and culture over all other values of the human civilisation, fulfill ideals of harmony, good neighbourliness, non-violence and non-resistance," - the forum organisers believe, reports Trend. "We address Nursultan Nazarbayev, President of Kazakhstan, as a state politician, whose activities in the light of becoming and development of the spiritual harmony idea is exceptional, calling him to become one of leaders in the creation of a new spiritual centre, capable of affirming the primate of spirituality and culture," - the statement says. Among the conference participants there are famous artists and cultural figures of Kazakhstan and Russia including Joseph Kobzon, Chingiz Aitmatov, Olzhas Suleimenov, etc.